How many of you still own your high school ride? If you’re old enough to remember being told to demand your MTV, we’re going to bet that you do not. Meet someone who still does: Mills Robinson, who has owned his 1967 Camaro since 1982. As a teen, Mills cut grass in order to buy his first car, a 1968 Camaro. A couple of months later, that car met an untimely demise when Mills was T-boned by an errant driver. He spent 10 days recovering in the hospital. His parents purchased this ’67 Camaro for him with the insurance money, and the two have been together ever since–in fact, had that first Camaro not been destroyed, Mills and that car would likely still be together. He drove the ’67 Camaro through high school and college, earning an engineering degree at Virginia Tech. Marriage and the birth of his son took priority over the Camaro, though, so the car was put in storage in 1992. 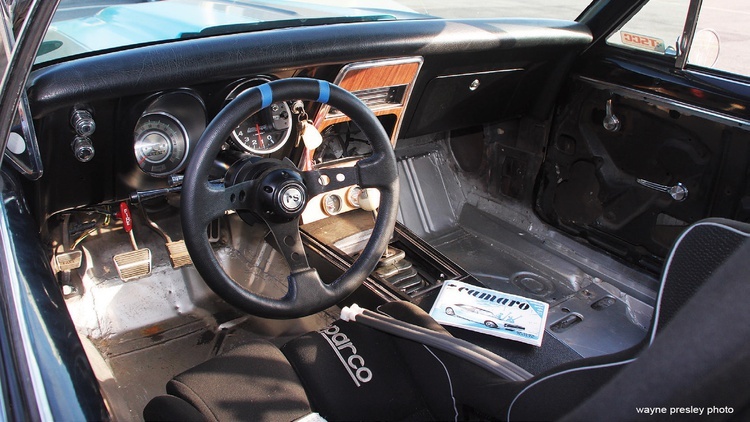 Eleven long years later, Mills dusted off his Camaro and began transforming it. 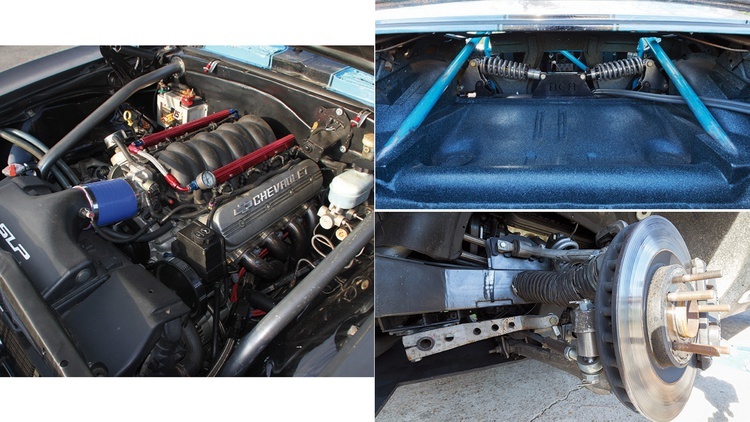 His goal: Add modern Corvette hardware to that classic Camaro shape, all while on a shoestring budget. 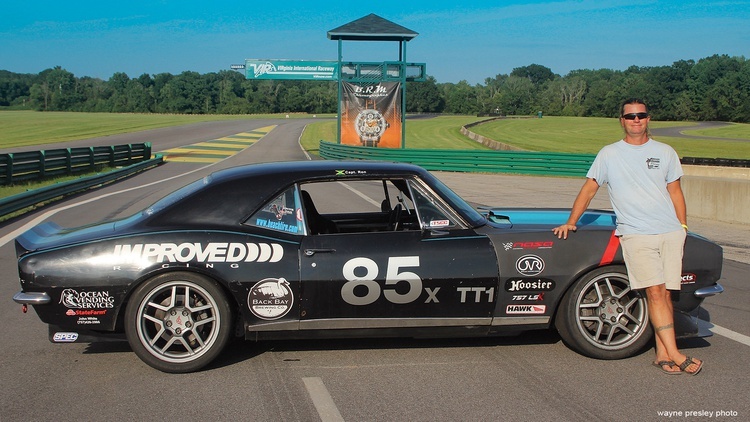 “I wanted to build a modern pro touring-style car out of it, but I didn’t have anywhere near the kind of money you see get put into those types of cars,” he explains. “Most are six-figure cars, so I had to build everything myself to keep up with the Joneses.” He concentrated on making a fast, reliable car, leaving the pretty stuff for later. Like so many other early Camaros, this one started life with a small-block V8 displacing 327 cubic inches and putting 270 horsepower to the solid rear axle. Those parts no longer remain. Mills replaced the original engine with an LS6 sourced from a C5 Corvette. He then fitted a big Comp Cams roller cam, long-tube headers, an upsized throttle body and a cold-air intake. The beefed-up LS sends 451 horsepower to the rear wheels through a four-speed transmission purchased from Michael Waltrip Racing. The dog box transmission, which can be shifted without using the clutch, came out of one of Waltrip’s road race trucks. All of that power is fed to a 1996 Corvette rear end that sits in a custom cage that Mills designed and built. The cage bolts through the reinforced rear unibody frame rails. The custom rear control arms feature rod ends for easy adjustment and zero deflection. “I think I had the whole thing in and out of the car 10 times before I was happy with how it was all set up,” Mills explains. The front suspension was built with C5 Corvette Z06 spindles and a K-member with arms again built by the ear’s owner/engineer. He removed the stock subframe and built a jig with all of the frame mounting locations. The new K-member was built with the LS engine mounts in the jig; then Mills started designing the suspension attachment points. Since the Corvette has a wider front track than the Camaro, the coil-overs had to go through the middle of the upper control arms. Fortunately, unlike the rear, the modified front suspension fit perfectly the first try. Front brakes are from the Z06 and rears are sourced from the C4 Corvette ZR-1. Koni coil-over shocks control the movement of the Hoosier A6 tires on Z06 wheels. Mills also addressed the aerodynamics of the nearly 50-year-old car. After helping a friend install a carbon-fiber splitter on a Corvette Z06, he fabricated one for his Camaro. This piece continued the budget theme, since Mills’s was built from materials found at Home Depot. Total cost for the plywood, 2×4, some sheet metal and the threaded rod was $36. To balance out the downforce, Mills built a diffuser for the rear. He made a template out of cardboard before heading back to Home Depot for supplies: one piece of sheet metal and some 1×6-inch boards. 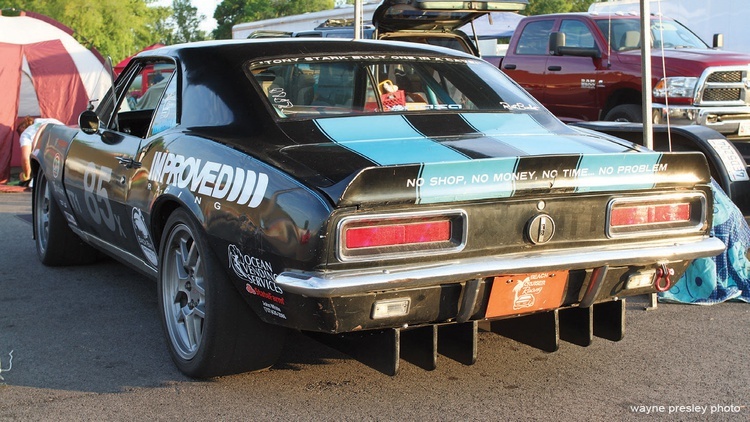 Mills’s rejuvenated Camaro hit the track for the first time in 2013, running Time Trial and HPDE events with NASA. After that, time brought improvements in performance. 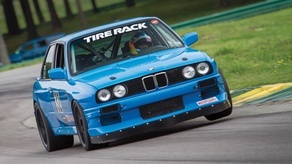 At our 2014 Tire Rack Ultimate Track Car Challenge, he lapped VIR’s full course in 2:12.558. He returned for 2015 hoping to break the 2:10 barrier and bring the car home in one piece. Sixteen of the track’s 18 corners feed the next, so a mistake on one turn penalizes drivers for the next four or five. The Camaro’s first timed session put Mills just above his 2014 best time, showing that his goal was within his reach. Then a 2:10.932 lap put him within one second of his goal. Could he reach it during the event’s final session? He did, recording exactly one lap below the 2:10 barrier. Two wheels off, unfortunately, negated that lap from the results. Despite the bobble, Mills proved a point: In a world where six-figure pro touring builds are commonplace, a home-brewed, low-buck Camaro can still shine. Not sure that "Aero" package built of heavy lumber is worth it. The Trans Am guys from the 60s had the aero worked out for these cars. Also question the transmission choice. Sure it's a race trans, from a race truck but a 6 speed gives you a better all around car. I never use 6th at the track, but it's nice to be loafing along at 1500 rpm at 70 mph on the way to the track. This story hits real close to home. I bought my 67 camaro in 1984 when I was 15. It was only a rolling shell and had a previous fire. Took me a year to get it back together and running. I drove it all through high school but when I went off to college (engineering school), I left it in storage at my dad's because it was not reliable enough to drive that far from home. 30 years later it needs a full restoration, but it is still in my possession. I'll get back to it one day when I have more time. Love what this guy did, fantastic home brew job. But as with a lot of home brew, the thing looks really rough around the edges. When I was a young man working in one of the best road race shops in the country, you could eat off the floor of every car that left that shop. Everything was super clean, painted, easy to inspect and looked like it had been built by an artist. Those cars won regularly. There is a reason they were kept that way and I wish these mega-talented home brew guys would follow suit, they'd gain a lot. You can tell instantly a pro job from a home build, and that's kind of sad because keeping them looking sharp is not that much more work. He's done some serious work to that car, and ballin' on a budget. One heck of a guy too, I got him soaked in my Camaro after going 4 off and hitting a puddle, and he actually got back in the car with me! great car. nothing better that doing what you love in something you built. I've driven a car with the trans mentioned in the article. The car it was in ate up four different transmissions, three of them were T56's. The four-speed was the last trans installed and lasted multiple events without failure. Shifting it was like shooting a rifle. I loved it. To each his own. I'm sure having a high cruising gear is damned nice while on the road. For those of us who prefer to do the jobs ourselves, rather than subcontracting, we value that satisfaction as much as the end product. I laugh at some of my prior projects that I come across, remembering how proud I was; surprisingly, some others still look pretty good. Time always seems to be a limiting factor. Great concept and great execution. Congratulations! Very nicely executed and a gorgeous body to boot. Not fancy, but I'd love to have something like this myself at some point. Always nice to see old American iron at the track. Keep up the good work! I still have my 1977 Toyota truck, bought new in 1977 and autocrossed since...uh...1977, I think. For sure by 1978. But since the Hotruck is built for FSP, it is not so impressive on a road course. Bags of fun, but not impressive. I tow to events behind my 1991 Toyota truck bought new in 1991, now with over 600,000 miles on the original engine, transmission, transfer case, and differentials. I keep meaning to put the limited slip I used in the Hotruck for a couple of years in the 4WD but have been too lazy and kind of hate to not be able to say original driveline! I fully appreciate the Camaro build on a budget! Would love to see the rear suspension from underneath if he used the full Corvette IRS but with rocker arm and pushrod shocks.